Add a touch of sophistication to your centralized mail delivery system with the 16 door Vogue Classic cluster mailbox accessories kit for CBU mailboxes. 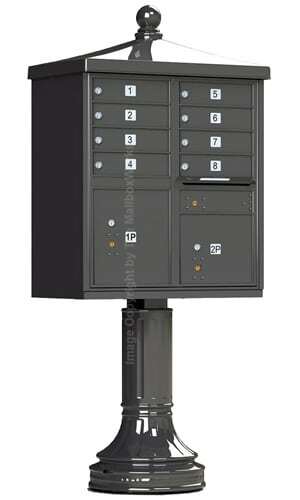 The classic Vogue cluster box column and cap come ready-to-install on all Auth Florence 16 Door CBU Commercial Mailboxes. 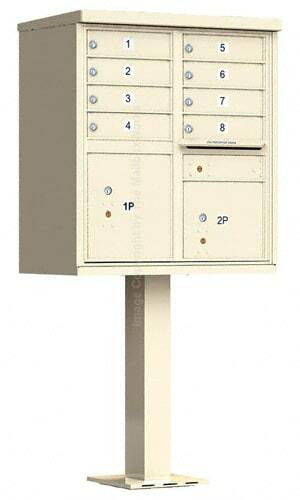 With such easy installation these cluster box units and Accessories Kit by The MailboxWorks are an economical way to style your neighborhood. 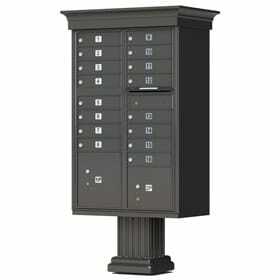 Designer cap and pedestal covers snap into place with self-tapping screws (included) while maintaining strict USPS security guidelines. 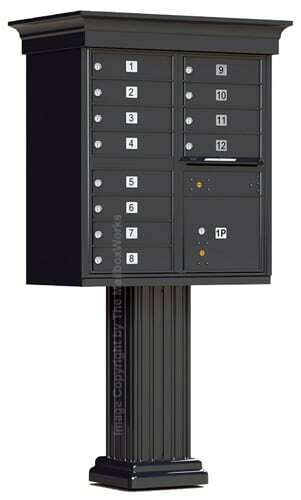 The fashionable 16 door Vogue Classic cluster mailbox accessories kit adds an extra touch of exterior protection to the CBU Mailboxes. 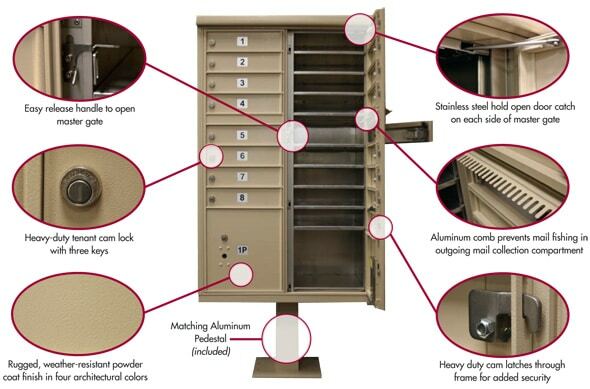 All accessories feature 100% die cast aluminum construction and a rugged, weather resistant powder coat finish in 4 matching Auth Florence designer colors. 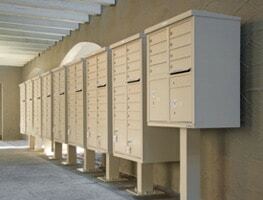 The “F” Series CBU mailboxes by Auth Florence is the preferred centralized mail delivery system and sets the standard for all CBU cluster box units manufactured in the US. 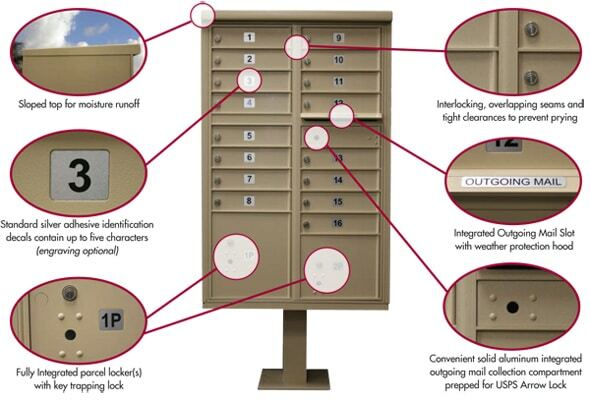 Featuring strong, pry resistant heavy duty tenant locks, fully integrated parcel lockers with key trapping feature, interlocking and overlapping seams and an integrated outgoing mail slot with weather protection hood. Rust-proof powder coating resists damage from force and also withstands harsh weather conditions. 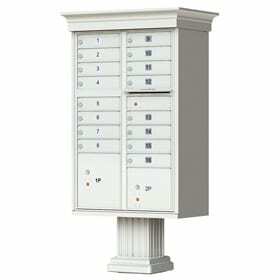 Crown moulding mailbox cap, column cover and pedestal base to be added to fully installed 16 Door cluster mailboxes. 16 Door Cluster Box Unit with Pedestal in one of 6 architectural powder coat finish options. 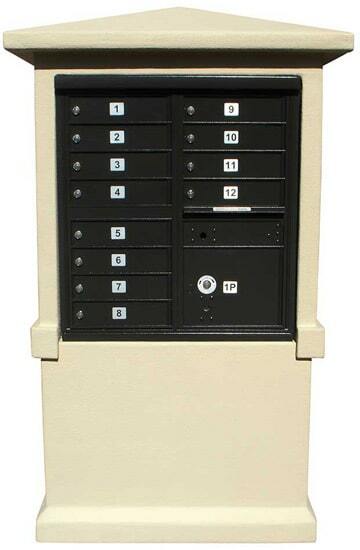 One outgoing mail slot, 2 parcel lockers with USPS approved locks and a set of 3 keys per tenant door. Choose from standard silver door labels as shown or have the tenant doors engraved (see order menu on right hand side for options). 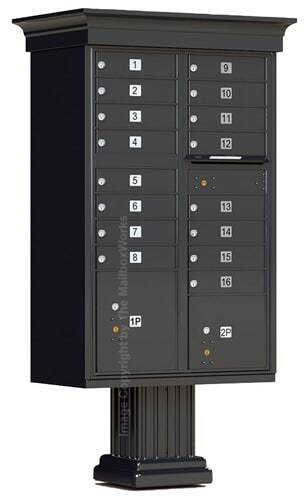 For more information or for help ordering the 16 door Vogue Classic cluster mailbox accessories kit, please call us or chat with a customer care rep if you have any questions.